This afternoon I ended up walking on Skaggs Island, inadvertently walked further than intended, on the portion of a road that isn't even shown on this map. It was a continuation of Skaggs Island Road. (Dotted lines indicated a proposed, not an actual trail area.) 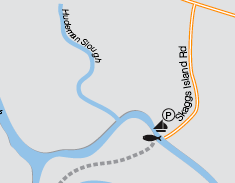 I thought the Skaggs Island Road trail ended out in the baylands somewhere, and that there was a parking lot at the end. I should have consulted that map again when I drove out there and parked my car. Instead of parking before the bridge, I crossed the bridge (shown) out to Skaggs Island, and couldn't find a parking lot way out there. (A barking dog kept me from going to the locked gate at the very end of the road when I tried walking this stretch.) I found out later that this area used to be part of a naval communications station. I got the feeling I shouldn't be there. And it was hot. So, I didn't stay long. During my walk, I was impressed by how quiet it was, and how I could hear the birds and bugs around me. I saw a snakeskin on the road (right), but no snakes, and just one lizard that escaped too quickly to be photographed. I did see what I believe was a hawk (an not an osprey) fairly closeby hunting for items in the marshy slough area (see image at right). 14 little brown jobs/songbirds; 10 white butterflies/moths; 5 flies; yellow jackets or wasps near possible ground nest -- I didn't want to get close enough to find out; 1 hawk; 1 blackbird; 16 swallows; 2 dragonflies; 1 turkey vulture; 1 lizard; and 1 mockingbird.